Today we wanted to remind you of National Geographic’s great website for young readers and explorers. Right now they have a special emphasis on winter, with videos of Polar Bear habitat and some amazing snow sculptures. There are loads of interesting videos, articles, games and puzzles for kids of all ages in this great site! You and your students will be surprised to find that peanuts aren’t really nuts at all! This unit on this remarkable legume will teach your students all about the peanuts, starting from the cultivation practices and going to practical uses of the plant. They will learn how to make their own peanut butter and uses for all parts of the peanut plant. Major subject areas are covered, including art, math, history, and language arts. Lots of great material in this 36 page study. This unit will take you and your students on a tour through the history of Flight. It starts with the dreams of flight and early ideas proposed and finishes with modern jet aircraft travel. Use this unit to get your kids excited about the science of flight and the mathematics involved in the design of flying machines. 40 pp PDF. Borneo is the third largest island in the world. Located in the South Pacific, it is made up of lush rainforest and unique habitat areas. This unit covers topics ranging from geography and population to wildlife and climate aspects. There is an emphasis in science and math in this thematic unit, but language arts, art, and other areas are covered as well. 18 pp. PDF. Click here to go to the download page for all three! The Pulse of the Planet daily radio program offers free mp3 downloads, exploring the world of sound in nature, culture and science, with audio adventures, world music, extraordinary sound portraits, science diaries, and nature ring-tones. Their Educator Resources page offers lesson plans, suitable for classrooms or home-schoolers, using Pulse of the Planet programs and sounds as a focus for learning activities on a variety of subjects, including microbes, forensics, conservation, sports science, energy, insects, and tooth & claw (bears, wolves, tigers and cats). Lots of great listening and interesting lessons here! The site requires a free registration before accessing the lesson plan library. 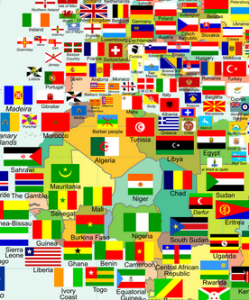 We are all familiar with flag charts, usually arranged alphabetically, but this one is superimposed onto a world map so that students can see details that are not obvious from the usual charts. By placing the flags geographically we begin to see new patterns, like bunches of near-neighbour countries (eg in Africa, Scandinavia and around Australia) having very simiar colourings and shapes. This fascinating map is very high resoluction, and can be downloaded or blown up to view details and specific areas of the world. CLICK HERE to view the map! Or to download, “right click” the link, then “save as” to your computer. Mac users, press the “control” key then click on the link and save to your mac. World Maps Online has a great collection of free lesson plans on how to read and use maps, for ages K-3, grades 4-5 and grade 6 and up. They offer their own classroom maps and globes for sale, and they are very good ones too — but honestly, you can probably use any detailed wall map of the US and world that you have handy for most of these step-by-step lessons, which can be read online or downloaded as PDF files. They are a great way to introduce geography to your students!